Home / Art & Photography / Grey Smith, HA.com Vintage Movie Posters interview: 'Who isn't affected by cinema? Grey Smith, HA.com Vintage Movie Posters interview: 'Who isn't affected by cinema? For years the world of movie posters has flown under the radar of most mainstream collectors. Despite the dominance that cinema has in modern culture, classic film artwork has been viewed by many as mere 'movie memorabilia' for only the most specialised collectors and cinephiles. But these same passionate collectors have long-championed movie posters as works of art in their own right. And without too much fuss or Hollywood fanfare, the market has continued to grow steadily year on year. The demand for the best and rarest posters remains stronger than ever, and in recent times auction houses have consistently seen record prices smashed. Nowhere is this more true than at Heritage Auctions, the world's largest collectibles auction house and a leading pioneer in the movie poster business. Since their first sale of posters in 2001, the company has quickly grown to become the market leader under the directorship of department head Grey Smith. His lifelong passion for collecting movie posters, combined with a 20 year career in the film industry, sees him perfectly placed to understand the nature of the market and its future potential. As Heritage prepares for another of its groundbreaking Sunday Internet Movie Poster Auctions, we had the pleasure of speaking to Grey about the wonderful world of one-sheets, lobby cards and life in the poster business. PFC: How did your passion for vintage movie posters begin? And how did your background lead you to becoming Director of Vintage Movie Poster Auctions at Heritage? Grey Smith: I began collecting movie posters when I was 11 or 12 years old. I grew up in the period of television, when the amount of locally produced or originally produced programming was limited, so many of the independent stations made up much of their air time with showing old movies. By the time I was five or six I was hooked on films of the 1930s and '40s. About 1969, I saw in the newspaper that there was to be a nostalgia convention - which was a fad in the late-'60s, especially on college campuses - with retrospectives of stars such as Bogart, Cagney and the Marx Brothers being shown. 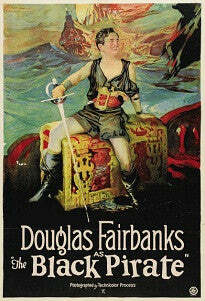 My grandmother took me to the convention and I saw that dealers were set up and many were peddling old movie posters. Most were asking no more than a dollar or two apiece for them, and I was fascinated. I bought six or seven and was hooked. I began to search for places to order catalogs to find these paper gems. Do you have a favourite movie poster? And is there a particular highlight (or highlights) from those you have sold throughout your career? Asking me about a favorite poster is really tough, as I love so many of them. Especially the one sheet posters, as they were usually made up of artwork the studios would commission to represent the film. Some of my favourites include B-Westerns such as John Wayne in "The Oregon Trail" or Hoot Gibson in "Rainbow's End." I love the earliest posters from the silent era of film, when almost all of the posters were produced using the Stone Lithography technique. They are some of the most beautiful images there are for films such as "The Black Pirate" with Douglas Fairbanks, "Son of the Sheik" with Rudolph Valentino, or Charlie Chaplin in "The Gold Rush." Not only are they some of the most beautiful posters ever produced, but also the most scarce as so much of that paper was lost in the WWII paper drives. In fact, any of the posters pre-1940 are by far the harder to come by. I do love the early 1930s posters from the pre-Hays Code era [a set of industry moral censorship guidelines introduced from 1930-38 under Hollywood's chief censor, Will H. Hays]. The posters are fabulous, as [they are] often done in the highly stylised art-deco designs of the time. Are movie posters simply memorabilia, or are they regarded as works of art in their own right? Well, movie posters have always been jokingly called, by some, "poor man's art." But seriously I think posters are a true art form, and not just movie but all forms of posters. [They] have a wide following as they are wonderful art to be displayed. You've described Universal's classic Horror movie posters as being the "blue chips of the collecting hobby." What is it about Universal - and why horror in particular - that makes them such good investments? The Universal horror classics have pretty much always been the top selling posters in the hobby. Universal Studios really developed the horror film from the mid-to-late 1920s, through the late 1940s, and made the classics that we all think of today with stars such as Boris Karloff and Bela Lugosi. The films are fascinating and hold a particularly fond memory for most people, who were frightened by them when they saw them as children. The posters are very rare as the demand has been great for many years. Since most of the real key titles of that genre, Frankenstein, Dracula, the Mummy, were done prior to 1940, there too is the reason for scarcity. Most of the key titles like that have fewer than a small handful of one sheets known to exist. Though there were often more than one style, one sheet produced by the studio, they are always beautiful and horrific images. Are there any posters which are today reasonably priced that you think could gain significant value in future years? There is the real question! I really haven't the slightest. But would think that, since poster production for the blockbusters is very great, that the posters for those may not be as scarce in the future as perhaps a smaller released cult classic like Bottle Rocket or Donnie Darko. Are you seeing increasing numbers of buyers of vintage movie posters? Are they emerging from any particular countries/regions? I think movie poster collecting is such a natural - and should be a far larger - hobby, as who isn't affected by the culture of the cinema? I think there is always a small rise in collectors in this hobby all the time, but I believe it is just not that widely exposed as a hobby and consequently remains pretty low key. Prices have gone stratospheric in the movie posters market in recent times. What factors do you think have caused this boom? Scarcity is really the key factor with great movie posters. The films have a timeless quality to them and more and more people are seeing these classics as they are almost all available via DVD or streaming video. Remember that one sheet movie posters were produced in extremely limited quantity, and most likely no more than 5,000 to 8,000 were ever produced in the heyday of the Golden Age [of Hollywood in the 1930s]. Now compare that to comic books, of which perhaps a million copies of each book would be produced from the Golden Age of comics. So, relatively speaking, posters are incredibly rare. Though the hobby is far smaller than something like comics, many posters will still command a high price as there is a strong demand.